Here at HVAC Webmasters we handle every single component of our clients’ web presence. From the day you sign up with us, we take over everything that needs to be done to ensure your web presence is ready to dominate locally. We help countless HVAC companies across the nation optimize for important keywords in their market. In fact, this month we want to highlight one of our clients who is dominating the Denver / Lakewood, Colorado, market. 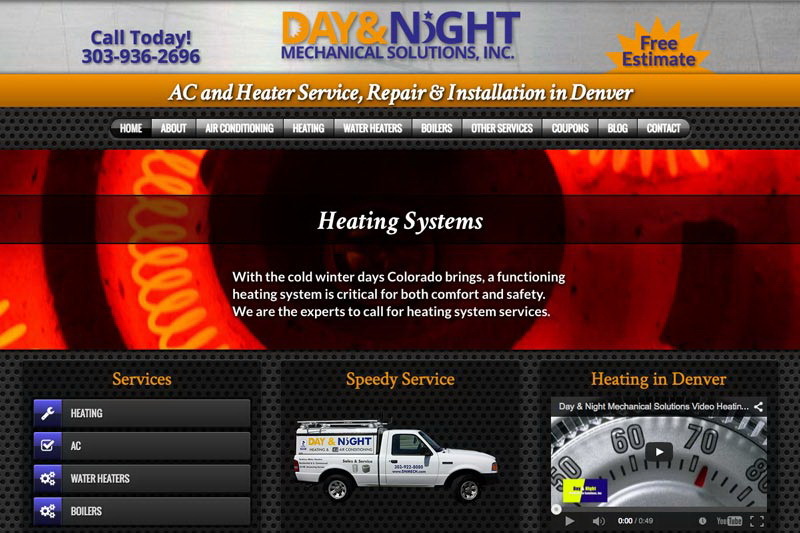 Day and Night Mechanical Solutions is a full service HVAC company that also sells used appliances. We have created a brand new web design for their business, set up everything technical they needed and wrote them brand new optimized content. We even run their social media campaign! These keywords are actual searches that people have been performing. And because of these keywords showing up on the first page of Google, Day and Night Mechanical Solutions has been able to garner more click throughs and important new leads! Remember, we work with each client individually. This means that we will research your specific local market to help target your most important keywords. Do you work in a climate that is known for brutal winters? We will help you get to the top for important keywords for heating repair. Or are you in a temperate climate where optimizing for indoor air quality control might be useful? Talk to us today about how you can be yet another one of our many success stories and stay tuned for more client highlights with HVAC Webmasters!